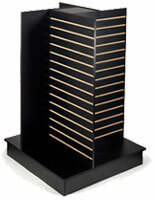 This slatwall "H" display is in stock today! We also stock 100s of other slatwall fixtures as well! 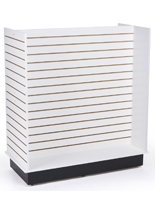 These slatwall displays help to form aisles for your customers to weave through. Since merchandise can be placed on all four sides they will naturally want to encircle the unit. 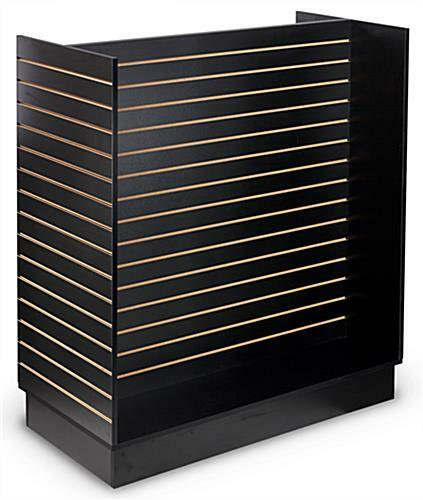 The slatwall displays feature a main center panel sized at 48" x 48" and is double-sided. The outer panels are half the size and hold items outside the "H". These slatwall displays support all available accessories like shelves, baskets, and hooks to allow for maximum freedom with the layout. 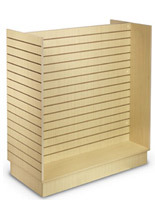 The black melamine construction is durable and showcases merchandise handsomely. 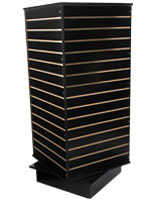 These slatwall displays are approximately 48" wide and 54" tall. The grooves in the panels are 3" standard and show the unfinished wood behind the black surface. 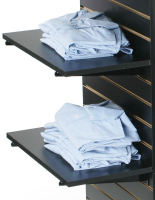 The slatwall displays will require hooks and hangers in order to display your merchandise. We sell these accessories separately, see link below. 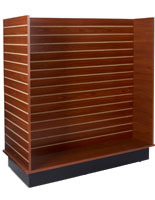 These slatwall displays boast 48 square feet of mechandising area in a compact space. Their inherent flexibility allows these fixtures to roll with new promotions and trends! Please Note: Additional accessories are NOT included with this store fixture.